If you’ve ever had the pleasure of flying business or first class, you know that the experience isn’t simply better than economy class – it’s like existing in an alternate, joyful universe level of better. You board earlier and with less stress. You have room. You have more services included. You enjoy better food and more attention. You have space! Basically, you arrive at your destination feeling good instead of like a sore, cramped, angry, and hungry mess. Economy fare gets you were you want to go for a more reasonable price. About the only thing that makes such trips bearable is getting a good deal. With 2mycountry.com, you’ll manage to enjoy a larger slice of the good life, as suits your budget. This travel and booking platform offers discounted business class flight deals – as well as cheap, economy class tickets and more bargain-priced travel services. On your way to pitch your startup at a huge conference? You know how much of a difference it would make to hit the stage well rested, focused, and in good spirits. 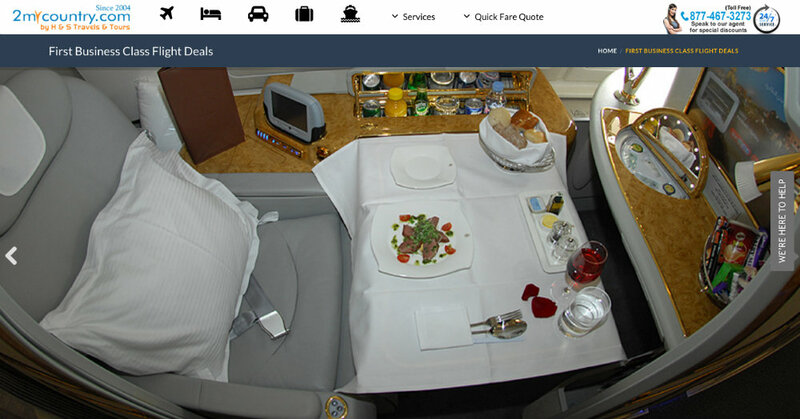 Doing so is no longer out of the question if you find a business class ticket on 2mycountry.com. Another huge benefit of finding fares on 2mycountry.com is that you’re spared the work of hunting down deals. It’s easy to go crazy making exhaustive comparisons, checking back repeatedly, trying to time deals right. Here, you avoid all such nonsense by having a few of the best deals to choose from that fit your schedule and budget. You can also speak directly to an agent who will help you dial in the tickets you’d most desire. The team behind 2mycountry.com has leveraged their experience in the airline industry to secure partnerships with leading airlines that allow them to offer customers amazing deals. No searching high and low for discounts. No buying tickets from sites with constantly shifting terms or delays in confirmation – and other strings impossible to keep untangled. Instead, 2mycountry.com lets travelers book and confirm instantly at affordable rates. Tired of the hassles of making flight reservations (not knowing where to turn, trying to sort through complicated terms, settling for high fares, etc.) and being shut out of premium tickets because of price? Quickly find low cost tickets – especially business class tickets – on 2mycountry.com.